Bullhorns in the morning. Scare tactics. Intimidation. In recent years, UNITE HERE Local 11 has emerged as one of the country’s most controversial labor unions. Primarily representing hotel workers in Southern California, Local 11’s primary goal is to expand its membership rolls and increase dues revenue—by any means necessary. To that end, the union favors large development projects and mounts raucous organizing campaigns to gain a firmer foothold in the region. Local officials, residents, and even union members have criticized Local 11 for threatening Southern California’s peaceful way of life. In 2016, the union had 21,949 members and 3,682 agency fee payers, while its assets totaled nearly $13 million. Data from the Office of Labor-Management Standards (OLMS) shows that union membership and dues revenue have essentially doubled over the last decade, as its push for skyline-altering hotels has boosted its membership rolls. Local 11 is a staunch advocate for new development projects in Santa Monica, Long Beach, and other cities in Southern California—as long as the jobs are filled by unionized employees. Because new hotels bring the possibility of unionization and increased dues revenue, Local 11 will go to extreme lengths in its organizing efforts—even to the detriment of visitors and residents. During organizing drives, the union often uses bullhorns at 7 am in the morning, waking up nearby residents. Local 11 supported developing The Plaza at Santa Monica, which at nearly 130 feet would be the second largest project under the city’s new Downtown Plan, and among the largest developments in the city. According to Santa Monica resident group Residocracy, the development far exceeds existing height limits, set at 76 feet for the eastern half of the project site and at 84 feet for the western half. The vast majority of Santa Monicans are at odds with Local 11’s development agenda. An extensive survey conducted for the city’s Planning Commission found that 60 percent of Santa Monica residents oppose the expanded height limits the union supports. Despite the opposition of its constituents, the Santa Monica City Council plays along. As city pay and benefits climb, the need for larger building developments to generate revenue for the city rises. Since 2012, employee pay and benefits at Santa Monica City Hall grew at more than double the rate of inflation, making new construction necessary. If businesses resist the union’s advances, it will make them pay. Local 11’s list of tactics includes an attempt to block new restaurants from opening inside nonunion hotels, preventing existing restaurants from expanding inside nonunion hotels, denying liquor licenses to nonunion hotel restaurants, and barring nonunion hotels from providing any amenity or service to patrons who aren’t hotel guests. [Local 11] saw its membership and revenues jump after the city included a union escape clause in a minimum wage hike on hotels. 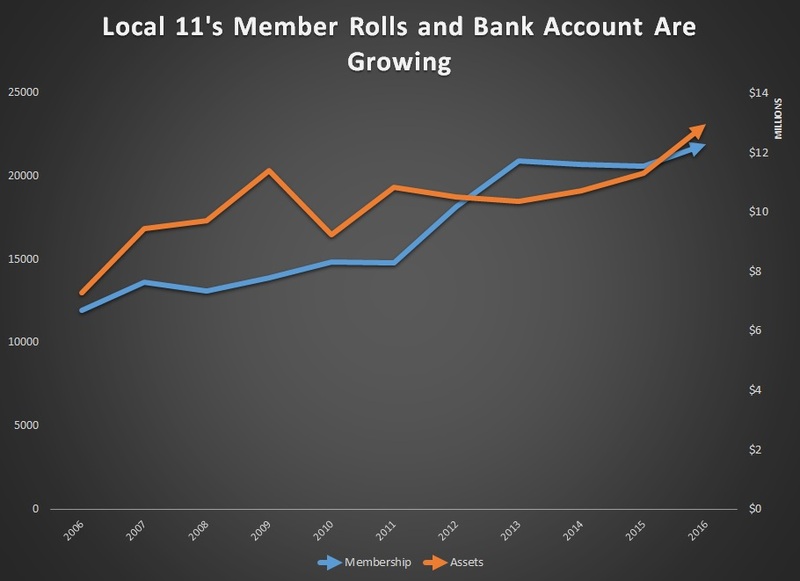 Local 11’s membership increased from 13,626 in 2007 to 20,896 in 2013, while its revenue increased from approximately $7.5 million per year to nearly $12.7 million. Other Local 11 members have publicly criticized their union on the condition of anonymity. Why? Because they feared “union intimidation” if their names leaked. From local residents to its own workers, UNITE HERE Local 11 has agitated countless Californians in recent years. The complaints range from the labor union’s early-morning use of bullhorns to its past attempts to carve out minimum wage exemptions. Tourists have indeed complained about Local 11’s bullhorn use, claiming it “agitate[s hotel] guests.” Some have even admitted that they won’t return to the affected areas because of union protests.